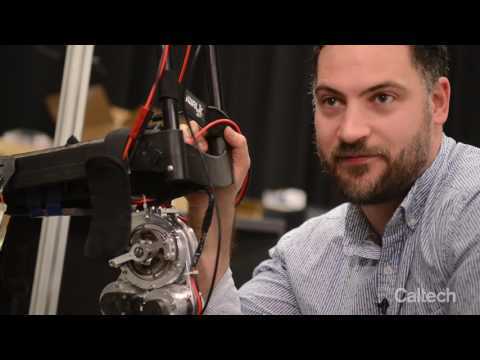 At the beginning of 2017, new faculty member Aaron Ames, Bren Professor of Mechanical and Civil Engineering, moved the Advanced Mechanical Bipedal Experimental Robotics (AMBER) Lab to the Caltech Division of Engineering and Applied Science from the Georgia Institute of Technology. At AMBER, Ames handbuilds bipedal robots and designs the algorithms that govern how they walk. These algorithms couple efficiency equations (how can I walk most efficiently?) with boundary constraints (how can I not fall over?) to teach robots to generate their own walking gait. Ames received a BS in mechanical engineering and a BA in mathematics from the University of St. Thomas in St. Paul in 2001, and an MA in mathematics and a PhD in electrical engineering and computer sciences from UC Berkeley in 2006. His appointment at Caltech is a bit of a homecoming; he was a postdoctoral scholar in control and dynamical systems at Caltech from 2006 to 2008. Recently, Ames answered a few questions about his research and sources of inspiration. People say it all the time, but Caltech really is special. Caltech is theory driven, and it fosters innovation because of that scientific focus. And at Caltech, collaboration outside of your specific discipline is much, much easier. You can walk out your door and talk to a theoretical computer scientist or a learning person or a vision person. At Caltech, you can live at the intersection of disciplines. To me, doing mathematics—and understanding why things work the way they do—is the only way to make fundamentally impactful contributions. I "do" robots, but really, I don't do robots. What I actually do is math, and put it on robots. Robots are the expression of the mathematics. Caltech is a perfect fit because it lets me express myself to the world through these platforms. What's your philosophy for designing robots? There are different approaches to robotics. The standard approach is, let's make the robot do a thing. You can turn a bunch of knobs and fiddle with a bunch of wires, and it doesn't matter how we do it, if it does what we want in the end. I don't subscribe to that perspective. Sometimes I joke, "Don't design without deriving." Don't just start putting stuff together without understanding what it means, and how the pieces fit. Start first with the math. Start at that fundamental level, and then work your way up in complexity. I think that makes it easier, because when you finally get to the hardware and you finally get to the robot, you understand why it's doing what it's doing. And more importantly, you can take that understanding and apply it to lots of different platforms and to a lot of places you wouldn't expect. You're not bound by the specific hardware you're working on. There is generalizability. Our work involves everything from walking robots to prosthetics to even exoskeletons. But the same methodology has been applied to cars for autonomous driving applications, and to swarm robotics, to quadrotors, to flying robots. Once you get that basic math you can apply it to a lot of different application domains. Science fiction is the short answer. I started reading sci-fi books from a young age and continue to read them to this day. It's my guilty pleasure I suppose, watching sci-fi movies and nerding out. Suspending disbelief. I hear a lot of engineers say, "I won't watch science fiction because it's so unrealistic." I actually view it a different way. When I'm watching a sci-fi movie, I say, "OK, it's totally unrealistic. How could it become realistic? What problems would we have to solve to actually make this feasible?" And that makes it really interesting. When I went into grad school I wanted to do robots, and specifically walking robots. To me, walking has always been this really special phenomenon because it's a deceptively simple thing. I often say that walking is simplicity on the far side of complexity. What the human system has to do is so incredibly complex but in the end, a smooth, natural motion flows out, and I want to understand how to do that in robots. How do you take all of this math, all these algorithms, all of these bits and ones and zeroes and make a fluid, elegant motion? So that's what's driven me for a long time, and I've finally gotten to the point where all of these things start to intersect—the math, and the hardware, and the application on physical systems. Free time? There's reading. I work out when I can, just to get my mind off of things. I spend time with my fiancée and our dog, often going for walks and hikes. But by and large, I live my job. To me, there's no boundary, and I like it that way, actually. My job is not really a job. I don't feel like I'm working when I'm working, so I kind of want to do it all the time.